Governor Home Screen – Welcome to the EMIT Technical Forum! The Governor Home screen (Pg. 500) shows an overview of governor operation. The current status is shown at the top of this screen. 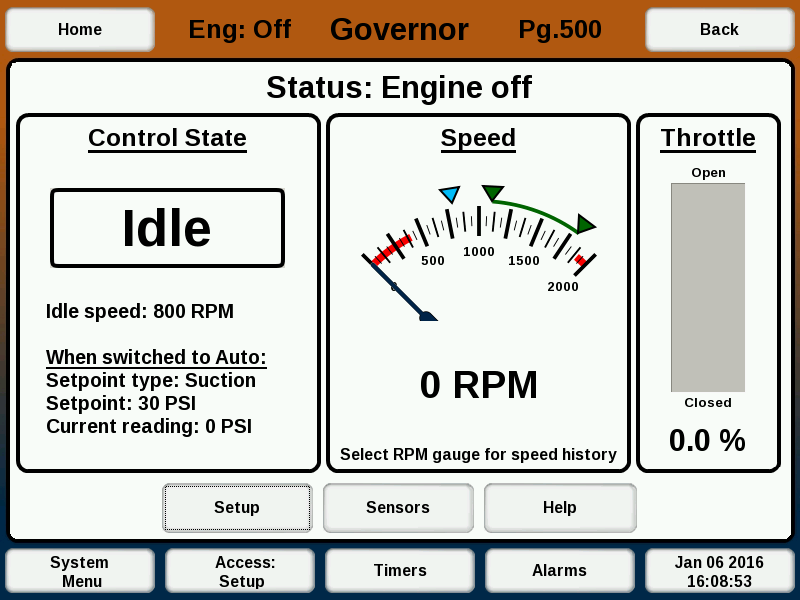 The left section of the governor home screen shows the control state, with the inner box in the left section showing the state of the panel’s mode switch – Idle, Manual, or Auto. The current control settings are shown in the lower part of this section. The middle section of the governor home screen shows the current speed. There are several additional markers on the speed gauge. The green marker or markers show the auto operating speed or speed range. A blue marker, if present, shows the temporary speed setpoint – either idle speed or manual speed. Red bars show the over- and underspeed alarm ranges. Under the gauge, the manifold pressure is shown if a sensor is present. The speed gauge can be selected to go to the speed graph screen, which shows a graph of the last two minutes of the speed setpoint and actual speed. The right section on the home screen shows the current throttle position, which ranges from 0-100%, with 100% being fully open.